How long does it take to see results from inbound marketing? What kind of results will I see? What exactly leads to those increases? If you've been asking yourself those questions, have no fear, the latest HubSpot ROI report is in, and it has answers to all those questions. The ROI Report is an analysis created in collaboration with HubSpot and MIT. By crunching numbers from our customers, we can not only get a perspective on the successes of our customers, but also a global view of how inbound marketing is working for businesses around the world right now. Start generating more leads from your website today with HubSpot's free tool, Leadin. These results come from a study based on data from 5,048 HubSpot customers and surveys from 236 knowledgeable professionals about their company's marketing strategy. Let’s jump right into the charts! 1) 92.34% of companies using inbound marketing increase their traffic. Tweet This Stat! We aren’t just making this stuff up! Real companies are seeing real world results with inbound marketing. 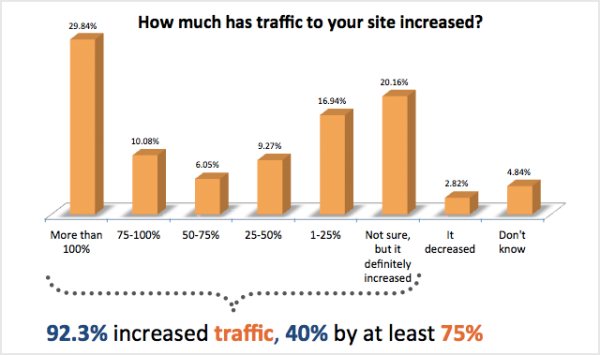 29.8% of companies using HubSpot have increased the traffic to their site more than 100%! 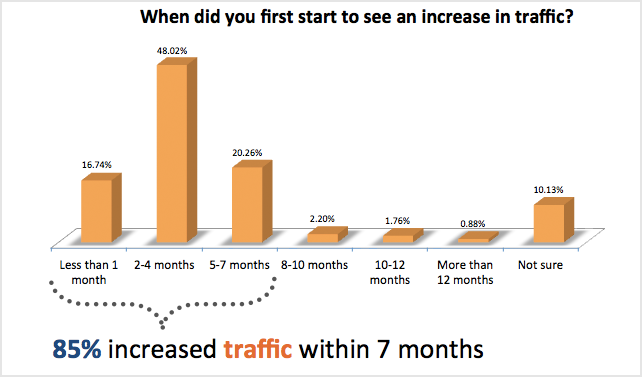 2) 85% of companies using inbound marketing increase traffic within 7 months. Tweet This Stat! We all know that inbound marketing takes time and patience to start seeing fruits from the labor. Surprisingly, customers started seeing increases far sooner than we typically talk about. 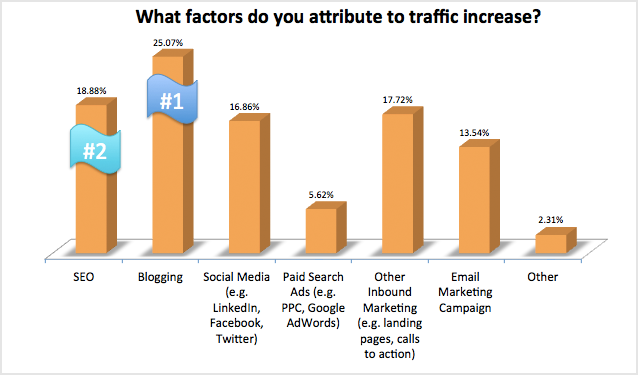 3) Blogging champions as the #1 method for increasing traffic, with SEO in second place. Tweet This Stat! This is an interesting stat that has changed since our 2011 ROI Report. In 2011, SEO was reported as the #1 method in increasing traffic. In 2013, SEO has fallen to second place with blogging taking the first spot. This is likely due to SEO today revolving largely around blogging to create fresh, unique content due to the Google Panda/Penguin updates. 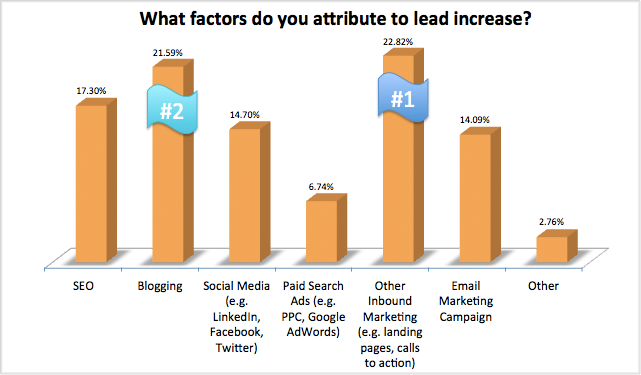 4) 92.7% of companies using inbound marketing increase their lead generation. Tweet This Stat! While companies have significantly increased their traffic using inbound marketing, they have seen an even greater increase in leads. 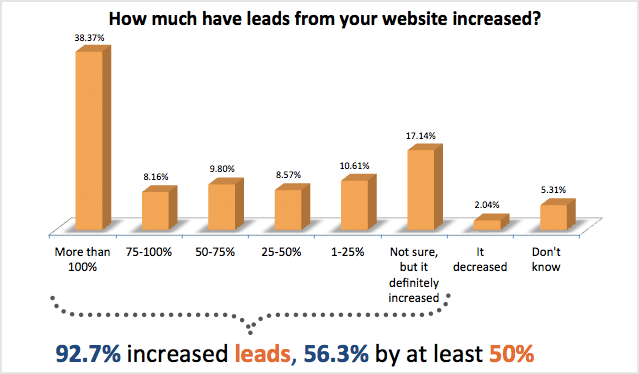 38.37% of companies using HubSpot have seen an increase in their leads of more than 100%! 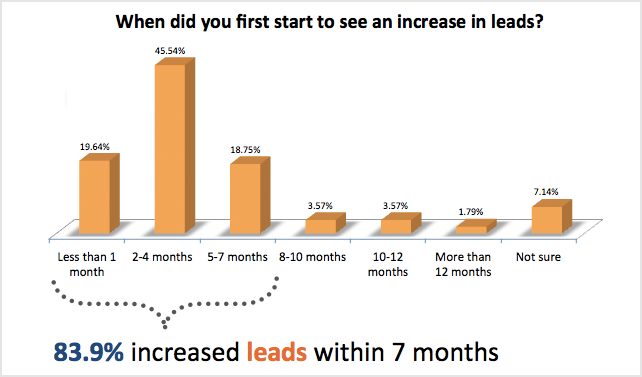 5) 83.9% of companies using inbound marketing increase leads within 7 months. Tweet This Stat! Companies today demand quick results from their investments, and here we see inbound marketing responding fast. All but only 1.79% of companies saw results within their first 12 months of utilizing inbound marketing methodologies. 6) "Other" inbound marketing techniques -- like landing pages and calls-to-action -- champion as the #1 method for increasing leads. Blogging comes in second place. Tweet This Stat! As we move from traffic to leads, we see MOFU (middle of the funnel) inbound marketing techniques like landing pages and calls-to-action reign supreme in driving leads. Blogging continues to prove itself as a powerful tool to be the second most popular method in increasing leads. 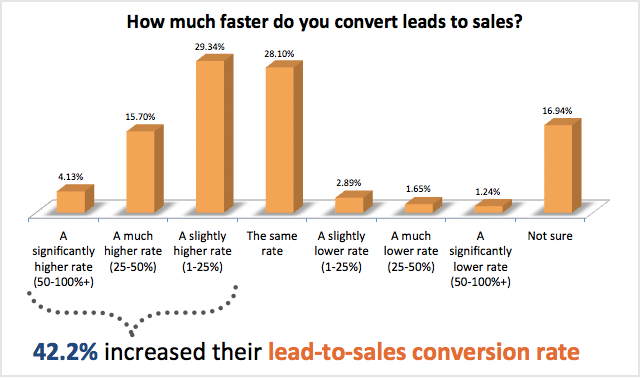 7) 42.2% of companies using inbound marketing increase their lead-to-sale conversion rate. Tweet This Stat! 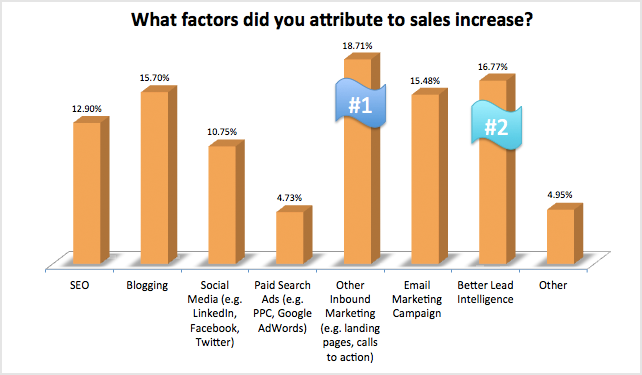 8) 49.7% of companies using inbound marketing increase sales within 7 months. Tweet This Stat! Increasing traffic and leads is an interesting statistic, but let’s get to the number we all as businesses truly care about: the bottom line. Companies using HubSpot software started to increase their sales and put real dollars into their cash-flow quickly. 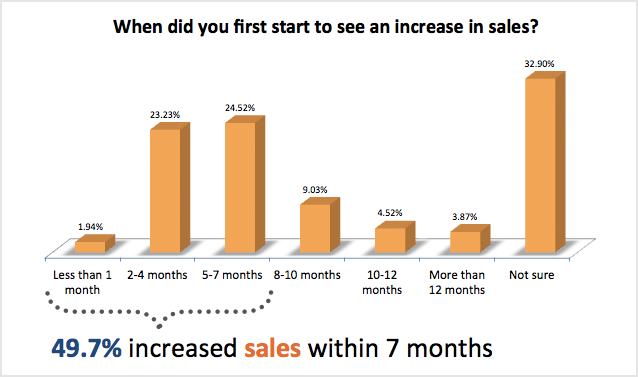 63.24% of companies started to see increased sales within the first 12 months! 9) "Other" inbound marketing techniques -- like landing pages and calls-to-action -- are the number one reason marketers attribute to their increase in sales, with better lead intelligence not far behind. Tweet This Stat! Lead management, tracking, and intelligence tools are critical when you're increasing your sales funnel and bringing in leads. A centralized marketing database allows you to capture, store, and grow information about your leads effectively. Check out the full inbound marketing ROI report from HubSpot and MIT for more details and thorough analysis. 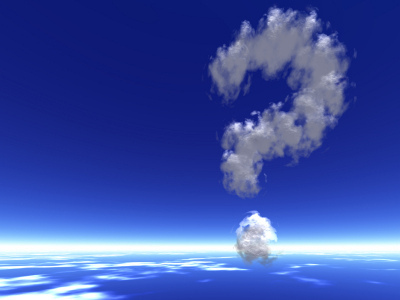 What are your thoughts about the return on investment of inbound marketing? Let us know below!